Tonight's update is another in the series of visual improvements. I have added circle shadow projections (turned out a bit different from what I expected, and I don't like the way shadows are projected from polygons now), and light levels. The light levels are difficult to capture in the screenshot, But basically the shapes are nearly black if they are unlit. And the closer they are to a light source, the brighter they become. Also difficult to capture in the screenshot is the light source flicker. The light on the left is created with "flicker" set to true, so it randomly turns off and on. I grabbed the shot at the right moment when the light was off, so you can just barely notice the black outline of the bulb. The background color is near-black now, it's exactly #111 in 3-digit CSS color notation. It could also be said to have an intensity of 17 on all RGB components (where full-back is 0 on each component). Lights can also be individually colored, recolored, strobed, etc. I can make a full disco-tech with it. ahaha! Though the one thing that's missing for colored light is blending those colors with each lit shape. Also on the TODO list with lighting is making beams. Like when emitted from flashlights, and lamp shades. This I think will not be difficult. I can just pre-render light through a clipping region. I think I still want to adjust the visuals a bit. Might be cool to turn the shapes into silhouettes by darkening them while brightening the background. :) The background should also be more or less silhouettes, as well. Since its all I can really do as far as art goes. 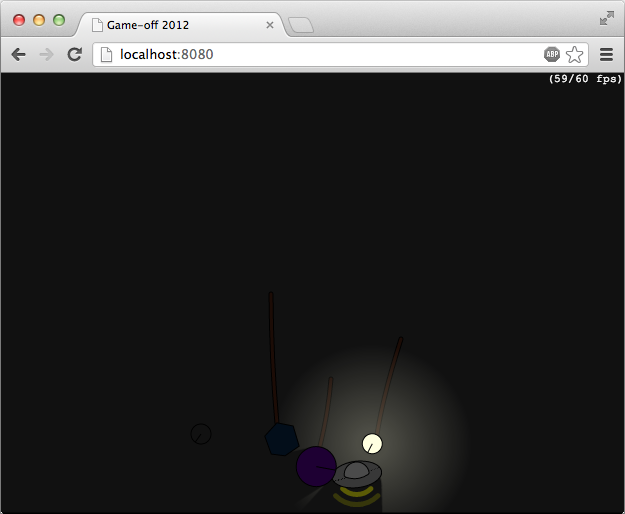 And I had a game concept in mind (not this game) that would use all of the lighting code that I'm making for this one. Anyway, you should really try the demo, because the screenshot doesn't do it justice. For the final week of the month, I will be focusing more on the gameplay elements. Especially the cloning gimmick. The attachment gimmick will also be important, but that's pretty much done already. I have a plan for doing the cloning... It will be interesting to see if I can come up with a nice little transition effect for it.